"Shin Megami Tensei: Strange Journey (真・女神転生 STRANGE JOURNEY) is a console role-playing game developed by Atlus for the Nintendo DS. 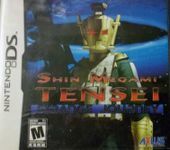 It is a title within the Megami Tensei series of video games, and was released in Japan on October 8, 2009 and in North America on March 23, 2010. Players take on the role of a Japanese (American, in the North America release) soldier assigned to a UN-mandated research team deployed to the South Pole to investigate an abnormal area in the region dubbed as the "Schwarzwelt" (German for "black world")." Source: Wikipedia, "Shin_Megami_Tensei:_Strange_Journey," available under the CC-BY-SA License.